This Evolve 65 is the Wireless version in this range, featuring Bluetooth connectivity and simple NFC pairing (Near Field Communications). With up to 100 ft / 30 m range and a battery life of 10 hours (3 hours full charge). 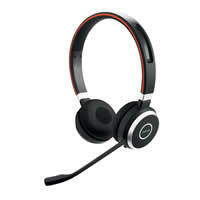 You can use this headset with your PC/VOIP phone (requires Bluetooth or the Jabra Link 360) and dual pair to one other Bluetooth device (i.e. your Mobile or Tablet) and then simply switch between them. Additional features are leatherette ear cushions, busy light (indicating in use/busy) and full Stereo Sound as well as Premium Noise Cancelling microphone boom that can be integrated into the headband when not on a call or simply listening to music. Also comes with soft carry pouch.